The aurora forecast is updated daily at midnight UTC. Magnetometers provide an alternative view of the level of geomagnetic disturbance occurring. A sudden steep change in the magnetometer is usually an indicator that an extended period (0.5 hours or more) of active aurora is beginning. This is especially true before 2 or 3 a.m. Scientists also find it helpful to see the time history of the magnetometer trace, since other indicators, like the all-sky camera, only show current conditions. Visit the magnetometer monitor for a chart of the current conditions. 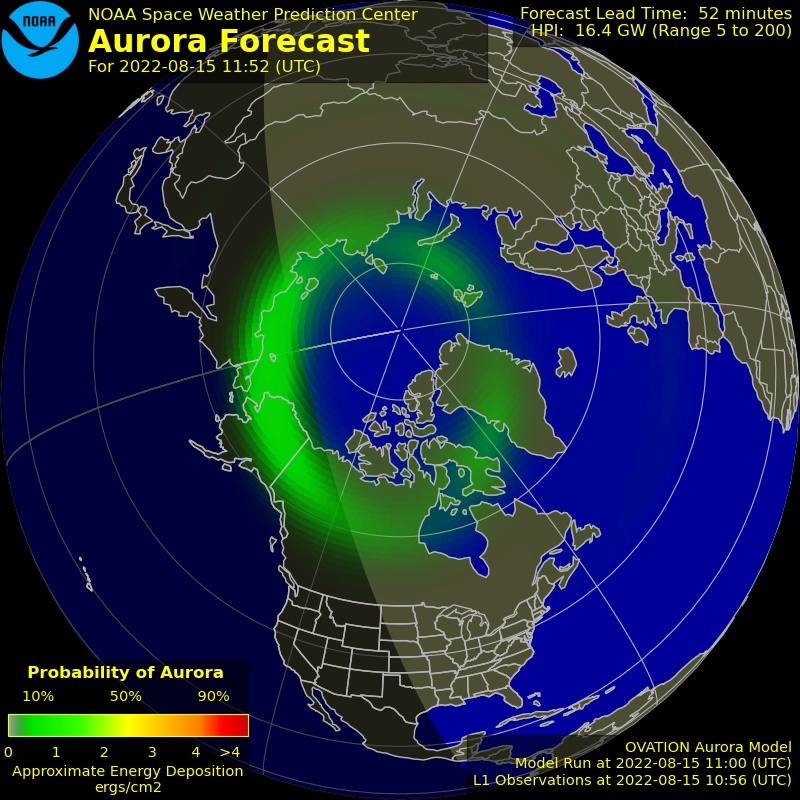 The National Oceanic and Atmospheric Administration (NOAA) Space Weather Prediction Center (SWPC) OVATION Aurora Forecast Model is updated every 30 minutes. The animation shows auroral activity that occurred over the Northern Hemisphere in the last 24 hours. Fast forward to the last few seconds of the animation to see what is predicted for the next 30 minutes. The aurora is not visible during daylight hours. Therefore, the model indicates the sunlit side of Earth in blue and the nightside hours in grayscale. Remote sensing spacecraft also monitor the sun for indications of impulsive eruptions that eject material toward Earth, or regions where continuous high-speed streams of material are escaping and heading Earthward. In either case, the travel time to Earth for such material leaving the sun is 1 to 3 days. This allows good forecasts to be made on these look-ahead time scales, based on events and conditions observed on the sun. Just as Earth rotates on its axis making a complete rotation every 24 hours, the sun spins on an axis making a complete rotation in 27 days. Solar phenomena on the surface of the sun distribute high speed plasmas that often result in increased auroral activity on earth. These phenomena may be sunspots, coronal mass ejection, filaments, or a prominence. As the sun rotates, the solar phenomena and resulting areas of high-speed plasma are likely to reoccur every 27 days until the phenomena dissipate. Therefore, if there is high auroral activity today it’s possible that there will be high auroral activity again in 27 days. This 27 day rotation is called a Carrington Rotation. How often can I see aurora? There is always some aurora at some place on earth. When the solar wind is calm, the aurora might only be occurring at very high latitudes and might be faint, but there is still aurora. In order for us to see the aurora, however, the sky must be dark and clear. Sunlight and clouds are the biggest obstacles to auroral observations. Where is the best place to see aurora? The best places to view aurora are high northern latitudes during the winter in Alaska, Canada, and Scandinavia. Furthermore, there is quite strong (but poorly understood) tendency for auroral activity to be stronger at equinox than it is at solstice. This so-called “Russell-McPherron effect” means that the statistical likelihood of seeing aurora over interior Alaska is roughly twice as high at equinox as it is at solstice. Combined with a slight preference for better weather in spring than in fall, this means that late February to early April are usually considered the best aurora viewing months in Alaska. To see aurora you need clear and dark sky. During very large auroral events, the aurora may be seen throughout the U.S. and Europe, but these events are rare. During an extreme event in 1958, the aurora was visible from Mexico City. During average activity levels, auroral displays will be overhead at high northern or southern latitudes. Places like Fairbanks, Alaska; Dawson City, Yukon; Yellowknife, NWT; Gillam, Manitoba; the southern tip of Greenland; Reykjavik, Iceland; Tromsø, Norway; and the northern coast of Siberia all offer a good chance to view the aurora overhead. In North Dakota, Michigan, Quebec, and central Scandinavia, you might be able to see aurora on the northern horizon when activity picks up a little. In the southern hemisphere the aurora has to be fairly active before it can be seen from places other than Antarctica. Hobart, Tasmania, and the southern tip of New Zealand have about the same chance of seeing aurora as Vancouver, BC, South Dakota, Michigan, Scotland, or St. Petersburg, Russia. Fairly strong auroral activity is required for aurora viewing in those locations. What is the best time of day to see aurora? The best time to watch for aurora is the three or four hours around midnight, but aurora occurs throughout the night. Active auroral displays tend to be more diffuse and fragmented later in the night, which means that 9 p.m. to 3 a.m. is typically the time period with the highest probability of seeing spectacular auroral displays over interior Alaska in winter. Since clear sky and darkness are both essential to see aurora, the best time is dictated by the weather and by the sunrise and sunset times. The moon is also very bright and can make it more difficult to view the aurora, so lunar cycles should be taken into account. What is the best time of year to see aurora? Clear skies are a requirement, so you should try to choose a location and a season that is blessed with the clearest skies. The continental locations in Russia, Alaska and western Canada under the auroral zone statistically have the clearest skies. Note that during the spring, the skies of Iceland and Scandinavia are usually clear. So the dark of the moon in March is the best time of year to travel to the auroral zone since the yearly cycle of auroral activity also peaks around the equinox. Sunlight prevents viewing the aurora during the summer at high latitudes. The skies at night are simply too bright as the sun climbs in the sky until the June 21 solstice and then descends. 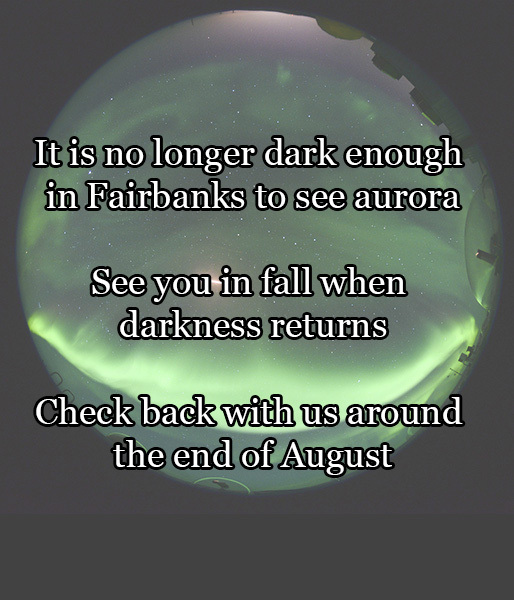 Here in Fairbanks, at about latitude 64.8, our aurora viewing “season” is August 21 to April 21. The odds are in your favor between those dates: if the weather is clear and you stay for at least three nights, it’s highly likely (though never certain!) that you will see the aurora. From April 22 to August 20 although the sun does set the sky never gets dark enough in Fairbanks to see the aurora even if it was a spectacular display. Why are some years better than others to view the aurora? The number of sunspots on the Sun's surface changes on a fairly regular cycle, which scientists refer to as the sun's 11-year cycle variation. Sunspot activity, and hence auroral activity, tends to peak every 11 years. This peak is called the solar maximum. The last solar maximum was in 2014; the next is expected around 2025. The chances of seeing the aurora at lower latitudes increase when the sunspot cycle is at a maximum, but chances at higher latitudes are not as dependent on the solar maximum because the auroral oval is normally present. Where should I view the aurora when I'm in Fairbanks, Alaska? For specific information on accommodations, tour companies, etc., we suggest www.explorefairbanks.com. People who live in Fairbanks, Alaska, are accustomed to spectacular views of the aurora borealis. Many residents routinely stay up late to photograph this phenomenon or just to experience the widely different forms it takes with each new display. Some people view the aurora from their homes, but many travel away from the city lights for the most spectacular views. The best time of year for aurora viewing is in the spring when the probability for clear skies is twice as likely as in the fall. The two weeks around the new moon in March is best; viewing can be good from early January to late April, however. If you come in the fall, the last two weeks of August and the first three weeks of September are best for weather, but the aurora is there behind the clouds (60 percent probability) during the entire winter. The time for viewing is between evening and morning civil twilight (when the sun is 6 degrees below the horizon) on clear or even partly cloudy nights. Major solar storms can occur any time; the aurora is usually most intense between 10 p.m. and 2 a.m. Viewing is best with little or no moonlight so if you can, avoid the weeks around a full moon. Visitors to Fairbanks should plan to watch from a hill away from city lights with a clear view of the horizon, since the aurora can occur in any part of the sky. During solar activity maximum years, most auroral storms start south of Fairbanks. During years of minimum solar activity, auroral storms start north of Fairbanks and occur in the midnight hours. Although trees make good foreground in auroral photographs, too many of them can limit the full experience of the aurora. Another concern for visitors is extremely cold winter weather. In those conditions small problems may be magnified into disaster at a site that is too remote. At some Fairbanks hotels you may be able to arrange for a wake-up call if the aurora is out. We should mention also that there might be some people who are hoping to hear the aurora. This is a once-in-a-lifetime experience for the aurora watcher. It may only be accomplished successfully during the most active overhead displays, on windless nights and away from any other noise sources such as barking dogs or traffic noise. The aurora is a luminous glow seen around the magnetic poles of the northern and southern hemispheres. The light is caused by collisions between electrically charged particles streaming out from the sun in the solar wind that enter Earth’s atmosphere and collide with molecules and atoms of gas, primarily oxygen and nitrogen. When the electrons and protons from the sun collide with oxygen and nitrogen in the Earth’s atmosphere, they gain energy. To get back to their normal state, they release that energy in the form of light. The principle is similar to what happens in a neon light. Electricity runs through the light fixture to excite the neon gas inside, and when the neon is excited, it gives off a brilliant light. The dancing lights of the aurora are seen around the magnetic poles of the northern and southern hemispheres because the electrons from the sun travel along magnetic field lines in the Earth’s magnetosphere. The magnetosphere is a vast, comet-shaped bubble around our planet. As the electrons from the solar wind penetrate into the upper atmosphere, the chance of colliding with an atom or molecule increases the deeper into the atmosphere they go. What is the auroral oval? The two figures below show the locations with the most frequent occurrences of aurora borealis (left) and aurora australis (right) during the period of best viewing around the middle of the night. This level of auroral activity, index Kp=2, will occur often enough that you will probably see the aurora if you travel to these regions when the nights are dark and stay for three days to a week, assuming that the skies are clear. If the auroral activity level is higher than 2, you will still observe the stronger motions and color changes, etc., that are seen farther equatorward. What makes the colors of the aurora? The composition and density of the atmosphere and the altitude of the collisions determine the colors. The aurora is most often seen as a striking green, but it also occasionally shows off other colors, ranging from red to pink or blue to purple. Oxygen at about 60 miles up gives off the familiar green-yellow color, oxygen at higher altitudes (about 200 miles above Earth’s surface) gives all-red auroras. Nitrogen in different forms produces the blue and red-purple light. Cameras have different sensitivities to colors than the human eye, therefore there is often more red aurora in photos than you can see with the unaided eye. Just like sunlight, which appears to be white, is a blend of the colors of the rainbow, the aurora is also a mixture of colors. The overall impression is a greenish-whitish glow. Since there is more oxygen at high altitudes, the red aurora tends to be on top of the regular green aurora. Very intense aurora often has a purple rim at the bottom. The purple results from a mixture of blue and red emissions from nitrogen molecules. What is the altitude of the aurora? The bottom edge of the aurora is typically about 60 miles (100 kilometers) above the surface of the Earth. The top of the visible aurora peters out at about 120 to 200 miles (200 to 300 kilometers), but sometimes aurora can be seen as high as 350 miles (600 kilometers). This is about the altitude at which the International Space Station flies. What are the types of aurora? Auroral forms can be divided into broad categories based on activity level and the viewer's perspective. At its least active, the auroral curtain forms diffuse, glowing streaks hanging quietly in the sky. This form has no distinct structure. When the aurora becomes slightly more active, vertical stripes or striations, called rays, form. These are actually fine pleats in the auroral curtain. The auroral curtain sometimes appears to touch a distant mountain top or even rise like smoke. This illusion occurs because you are seeing a several-hundred mile long aurora near the horizon where perspective gives the illusion that it is touching the ground. The aurora may appear as rays shooting out in all directions from a single point in the sky. This dramatic form occurs when you are directly beneath the swirls and folds of an active curtain. The rays are actually hundreds of miles long and perspective makes them appear to converge. Can you hear the aurora? It is easy to say that the aurora makes no audible sound. The upper atmosphere is too thin to carry sound waves, and the aurora is so far away that it would take a sound wave five minutes to travel from an overhead aurora to the ground. But many people claim that they hear something at the same time when there is aurora in the sky. We are aware of only one case where a microphone has been able to detect audible sound associated with aurora (visit Auroral Acoustics: the web site does not have sound samples, but you'll find a link to an in-depth paper and recent news on this topic.). The sound is often described as whistling, hissing, bristling or swooshing. What it is that gives people the sensation of hearing sound during auroral displays is an unanswered question. By searching for an answer to that question, we will probably learn more about the brain and how sensory perception works than about the aurora. Can you predict when and where there will be aurora? Scientists can predict when and where there will be aurora, but with less confidence than they can predict the regular weather. The ultimate energy source for the aurora is the solar wind. When the solar wind is calm, there tends to be minimal aurora; when the solar wind is strong and perturbed, there is a chance of intense aurora. The sun turns on its own axis once every 27 days, so an active region that produced perturbations which resulted in aurora might again cause aurora 27 days later. The solar wind takes approximately three days to get to the earth on its way from the sun. Observing the sun and predicting perturbations in the solar wind resulting from events taking place on the sun (such as flares or coronal mass ejections) provides information in a few days in advance of possible auroral displays. Spacecraft such as the Solar and Heliospheric Observatory (SOHO), Solar Terrestrial Relations Observatory (STEREO), and Solar Dynamics Observatory (SDO), provide researchers with data on activity occurring on the surface of the sun as well as in the solar magnetic field. Another source of data used to predict the aurora comes from satellites located approximately 90 minutes or 1,500,000 km away from earth. The Deep Space Climate Observatory (DSCOVR) and Advanced Composition Explorer (ACE) Real-Time Solar Wind satellites provide real-time data to researchers about geomagnetic storms. Data from these satellites provide about one to two hours' warning of an upcoming aurora. What is the solar wind? Streams of charged particles that produce the aurora come from the corona, the outermost layer of the sun's atmosphere. The corona is exceedingly hot, measuring more than one million degrees. The high temperature causes hydrogen atoms to split into protons and electrons. The resulting gas of charged particles is called plasma, which is electrically conductive. The solar plasma is so hot that it breaks free of the sun's gravitational force and blows away from the surface in all directions. The movement of this plasma is called solar wind. The intensity of the solar wind and the magnetic field carried by it change constantly. When the solar wind blows stronger, we see more active and brighter aurora on Earth. What is the 11-year solar cycle? The Kp number is a system of measuring aurora strength. The range goes from 0 to 9 (0 being calm, 1 very weak, all the way up to 9, which would represent a major geomagnetic storm with strong auroras visible). Anything Kp 5 and above is classified as a geomagnetic storm. The Kp-index was introduced by a German scientist named Julius Bartels in 1939. The abbreviation Kp comes from the German "Kennziffer Planetarische," which translates loosely as “planetary index number,” although it is better known in English as simply the planetary index, and is usually designated as Kp [number from 0 – 9]. A daily forecast of geomagnetic activity for the next three days provided in 3-hour intervals. over your location in the next 30-mins.